A beautifully practical and intuitive practice which creates a space for you to Flourish. Combining Form and Compass School, The Flying Stars and Energetic Healing principles. An up to 2.5hr onsite visit. 15 plus page report and checklist for your space. A downloadable 45 min plus Mp4 – Room by room analysis. 45 min Skype follow up call. And you are bursting at the seams to create a space that will allow you to flourish and shine! Book Your FREE Skype Enquiry Now! "Doing a Feng Shui audit is comprehensive, accurate and something that provides a foundation to the energy of your home for life. Its that significant." I was doing everything that I thought I should be doing in my business. I was bonding and talking with my clients. And I was creating awesome programs and classes to nurture people. As it turns out I was getting amazing breakthroughs and results with my regular customers. And that was just for starters. I wrote regular newsletters, blog posts and even posted out snail mail to existing clients. I went to networking events and had business coaching. I still didn’t see any significant results in my business, in fact, I ended up losing money. Lots of money. Sadly, I had to close my clinic I had worked so damn hard for and was at a loss to what went wrong. Quite frankly, I wanted answers and wanted to find out why this happened. This took me on a journey with the ancient practice of Feng Shui. Finally, after completing my Feng Shui qualification I found out the A to my Q. Simply stated, my clinic held a negative pattern that did not support me financially. Meaning that no matter how hard I worked, how many hours, sweat and tears I put into my business this space needed harmonising to support me and my business. Though by the time I had realised, I had left my clinic and closed the doors. Looking back, I now know it could have been remedied and enhanced the space for it to work but I had moved on. I have created a space that truly supports me, supports my productivity, supports my success and my wealth potential. In fact since working from this space I have had people want me to work with me before they even knew what my services were! In my experience Feng Shui-ing my business has opened new doors and opportunities for me. And I want you to have the same success story! Optimise the space that you have in order to create the best foundations for you and your family to flourish and thrive in! Create a space for your business to shine! BONUS - and if you work from home you also get your whole home audited, which includes harmonising the family unit! EXTRA EXTRA BONUS - You also receive a mini Website Review for your business. This is where I check through your website and suggest changes to assist with the 'energy' according to energetic healing principles. I had no idea it would be so detailed and comprehensive. Thanks so much for doing such a great job on our report. I had no idea it would be so detailed and comprehensive. And I really like the fact that you have done it in the audio form as well as all the written material. I listen to it when I am doing chores around the house and get more out of it each time I put it on. I can’t believe, now, that it took us so long to decide on getting it done. I suppose we were worried the whole thing would cause too much upheaval in our lives but actually, because you give us several options of how to respond to the energy in each area of the house, we have been able to implement the simpler things you mentioned first, giving ourselves time to think about the bigger changes we can make, further down the track. I am looking at the sun room right now and getting quite enthusiastic about the changes we are going to make there. I will keep you posted as to our progress. Thanks again for a terrific job. Key Costumer for Superman Returns, The Narnia Trilogy and The Matrix movies. Feng Shui is not only about moving furniture. You may have to move some furniture in your home to assist in balancing the energy, but it is not the main objective. Feng Shui does not equal filling your space with Feng Shui trinkets and symbols! When you love your space, when you fill your space full of things that bring you joy, when you create a space that reflects the beauty within you, then you are creating a space that will nurture you and your energy. You get to keep your furniture and home wares! Feng Shui is not about superstition or superstitious practices. The first schools of Feng Shui in China revolved around the best place to bury the dead. This was because they believed that if they weren’t buried in an auspicious place, then this would affect the children or predecessors of the deceased. From this theory superstition arose and filtered into Feng Shui for the living. Though true Feng Shui is not about superstition, it is about energy. Feng Shui is the ancient Chinese art of sensing and positively working with the energy in your environment. This has a direct reflection and affect on you and your mental, emotional, physical and spiritual aspects of self and your ability to create an abundant life. Feng Shui encompasses the school of thought that everything and everyone is energy. When you understand how it works within your home, office and environment you can adapt your space to allow the Qi (energy) to assist in bringing your highest possibilities, good health and potential to your life. Feng Shui has been used for over 4000 yrs and is highly respected and considered a sacred practice in China. Feng Shui uses the Chinese five element theory to accurately determine the energy within each individual home. This is the same theory that Traditional Chinese Medicine, Kinesiologists, Tai Chi, Qi Gong, Acupuncturists and Chinese Astrologists use. This is where I come to you and check out your space. You can't get a feel of a place if you don't stand on the soil of the site. It is so important that I am there in person so I can pick up on and tap into the many layers of your home and/or business. You then show me around your world, your space. And the ins and outs of how you function in your space. Not of you. I take photos of your space. Sometimes your space can show me more things in photos. But more so I don’t forget stuff. If you need me to create your floorplan. This is when I do my stuff and measure up. I then wander outside, if possible, and meditate. I tap into your site’s Omphalos and get information. I may then draw up your Flying Star chart and discuss the energetics of your home or business. I may be able to pin point your positives and challenges with in your space. This whole process could take up to 2.5hrs (or more). Phew. I know, right? I am very thorough. I then promptly leave with all my information. We may hug. I like hugging on my departure. Your report will be your home or business's Feng Shui Bible. This report will have all the information in it you need to create a space that will allow you to flourish! And contains all the juicyness of what you can do in your home or business to allow it to shine like a beacon! When I get home I get to piece and pull everything together. I collate, meditate and express it in pretty pictures and words. This will be your report. Your report is actually two things. One 15 + page written report full of info and your checklist of the suggested changes. You also get a 45 min plus audio video of me talking through your home re suggested changes and what the energy is holding in your space. This may take up to 3 weeks to get to you. Yeah, I know, it’s big and long. But it covers everything you need. I am uber passionate about giving you the ‘everything’ so you get the most out of your space. No cutting corners. ‘But tell me what’s in it!’ – I hear you say… 1. Your floorplan with it’s energetic blueprint information. 2.Info of where your True Wealth sector is and how to activate it. 3.The best areas where to work from, sleep in and play in. 4. Recommendations on how to detox your space and lower your exposure to EMF’s. 5.How to arrange your space to nurture, support and unite your family or staff. 6.Suggestions on how to enhance your relationship, health and wealth sectors…and much much more! I then create your digital report and audio video and upload it to Dropbox. I then share the folder of your goodies with you. And allow you to read, watch and read some more. Think and ponder. It is really important that you have access to me after you read your report. You are going to have questions and you are going to want to know how certain things apply to you and your space. You have received your report! So you have it in your hot little hands! YAY! I would encourage you to read it, watch it and then read it again and watch it some more. Then go from room to room reading each section and then write down ANYTHING you need clarity on. Then once you have your list, book yourself in for our follow up chat. We get to chat for an 45 mins! And I get to answer all your questions you may have about your Feng Shui report! It’s a total win – win! We will then bid farewell…. though I do have to warn you… I expect photos and updates of your progress. As I love witnessing how things unfold for you! Step 4. It's all up to you! You are now armed with all the information, recommendations and suggestions to Feng Shui your space to the bejingo. This is when you become empowered. This is when you yourself start to make those positive changes for yourself. You create YOUR change. You may come up with resistance every now and then but push through it and create your space for YOU TO SHINE! Happy Feng Shui-ing my lovely! What Feng Shui can REALLY do for you! Feel more confident, supported and empowered in your home and business allowing you to boost your self trust. Enhance positivity in relationships and harmonise your interactions with your family and co-workers. Increase your ability to attract abundance into your home or business promoting your success. Increase your ability to maintain or improve your health and well-being. Relax, feel at ease and love where you work, play and rest! Break through old patterns of lack and start to bring in more energy and abundance. Bring family and people together in an environment where each person is supported and nurtured. Lessen arguements, disagreements, accidents and challenging behaviours. Create a solid foundation from which you and your family and/or business is able to flourish! Enhances clarity, focus and direction in your business and life's pursuits. Strengthen your connection to your space, to the energies that surround you and learn how you interact with them. I meditate and gain information before coming to your site. This provides energetic information and a bit of background to take into consideration. I delve into the history of your site or building which can provide clarity regarding the patterns that your site may be holding. I use Form School principles to provide information regarding your surroundings and how to arrange your furniture to make your space work for you. I use Compass School principles to provide information about aspects of your life and members of your family, how you can enhance and support these areas to assist balancing these aspects. I use the Flying Stars to provide a blueprint of the energetics that is particular to your individual home. It provides specific information on the best places to sleep for your health and relationships, where your true wealth sector lies and how to dampen the challenging energies for harmony. I carefully watch and listen for signs and symbols that come to me before, during and after your audit which usually reinforces the energy that is currently playing out for you and your home. I tap into the Omphalos of your site, which is your sites information station and will tell me more about what may be occurring for you. I intently listen to your words, statements and language which provides information of any challenging patterns. I look at your personal items within your home which can tell me a story or hold energy that may or may not resonate with your ideal sacred space. I check out the health of your environment. I investigate how much you are being exposed to EMF’s and toxic chemicals and how this may be impacting you. I then weave all this information together to help me assess how to best harmonise your home and/or business. What do I need to provide for a Feng Shui audit? For me to be able to provide an accurant reading of your space I need the year your building was constructed. Now… don’t guess this! Which a lot of people tend to do, it will not be accurate, and if you provide an inaccurate age for your building then the whole of your audit will be incorrect. The easiest way to find out is to call your council or waterboard. The waterboard has been an easier route to take, from experience. All you need to do, is to call them and ask when the water for your property was initially put on. You also need the year in which any extensions were built. And an accurate to-scale floor plan of your home or business site. Help! I don't have a accurate to-scale floor plan of my building! What can I do? Renee to the rescue! Yep, I can do that too! I know… woman of many skills and talents. If you don’t have a current or accurate to-scale floor plan I am able to provide that service for you. It takes about an hour and can be done when I come for your onsite visit! This is an extra service which costs $170 for an average 4 bedroom sized home or building. For any extra rooms it is usually $40 for each add on. This is about $200 cheaper than getting a real estate agent or draughtsman to do it. I live in an area you aren't currently travelling to, but I'm very keen to book your services. How can we work together? No problemo… Drop me an email and we can talk. Depending on where you live, I may be able to put a call out to see if others in your area are also keen for audits or geomancy. I can then book you all in for a few days and spend some lush time in your home town. Also Distant Feng Shui services are coming soon! Can I use Feng Shui to help sell my house or business? You betcha! Infact Feng Shui- ing your home to sell is really popular. The purpose of using Feng Shui to sell a home is to harmonise the space in order for the home to sell quickly and for the best price possible. You are provided with how to joosh up the front of your home to attract buyers and how to stimulate your true wealth sector for you to generate a good selling price! If you have a bricks and mortar business, using Feng Shui will help to build interest, sell quicker and for the price you are asking. Can I get a Feng Shui audit before moving into my home or business site? Yep! If you are looking for a house to buy or a site for your business you can definetly use Feng Shui to help you choose the perfect home or business site for you. If you wish to have a Feng Shui audit done for this purpose and depending on the site, I may be able to do the audit distantly with only a floor plan, age of your building and photo of the front of the building. This can provide a lot of information but obviously not as detailed as an onsite audit. Drop me an email if you are interested in this service. We are a large corporate firm, can you provide a Feng Shui audit for our company's HO? Yes and… no. Yes you can Feng Shui these buildings but for me large corporate buildings are not where my passion lies. So I prefer not doing these sorts of buildings. I would advise searching for another consultant where this is where they shine. I love working with female entrepreneurs who either work from home, a clinic or studio space and assisting sole traders. We rent, is it still worth Feng Shui-ing our home? It sure is worth it! A Feng Shui audit is not going to tell say you have to paint walls, change doorways or make huge structural changes to your building. It can, if that is what you want me to provide but mainly we work with what you have and your circumstances. Most changes that you may need to make will be very adaptable to a rental home. Also you can take your Feng Shui enhancing items and remedies to another home if you decide to move. If you have implemented all the suggestions I have recommended, have everything up and running and maintained, then it may take about two months to feel the full effects of the change in the energy. Sometimes sooner! I know that if something happens in our wealth sector or I haven’t maintained it, it impacts on both mine and my partners work. This is sometimes within hours of noticing. Though we always say two months to allow for tweaking and the transformation to really be noticed. You’re enthusiastic for positive change. You’re willing to acknowledge your blocks and move on. You work hard to make improvements. You’re open and honest with your situation. You’re willing to listen to suggestions and recommendations. You can let go of what is not working for you and be open to receive. You are ready to shift into awesomeness! You want a quick fix to your finances. You’re not honest and open with your dealings with others. You want someone else to come in and make all your changes for you. You’re not willing to dig deep and look at your challenges. You want to use it as a band aid and the ‘be all’ to end all your woes. Your house is overly full of clutter. I recommend you clear your clutter first. You don’t like positive change! Say - Yes, that's what I need - to a Feng Shui audit. Once you have decided that you would like to overhaul your space which also equals overhauling your life and/or business, then we can get the ball rolling! Ask yourself do you have everything to start an audit? Do you know the age of your building? Do you know when your extensions were built? If not, you best get a wriggle on and find out. Do you have a floorplan or would you like me to draw one up for you? We book in a date! You will then receive a friendly email from me with available dates you can book your audit. They will usually fall on a Monday, Thursday or Friday. You will also receive a link to an online form for you to complete. Once I receive all that info from you, I will confirm your booking and we will be on our merry way to creating a space for you to truly shine and flourish! Do you live in Newcastle, Hunter Valley, Central Coast or Port Stephens? And are you ready to Feng Shui your little heart out? Cost of a complete Feng Shui audit can vary between $500 and $2500 depending on your property, size, renovations, building, use or purpose. e.g. a small business shop with no website, 1 or 2 staff may only cost $500. Though a large home with 3 living spaces and 5 bedrooms may cost over $2000. BOOK Your FREE Skype Enquiry Now!!! Do you live in Brisbane, Melbourne or Sydney? And are you ready to Feng Shui the bejingo out of your home or business? Leave your details below to receive consultation dates available in your city. YES! I’m ready to Feng Shui! Still not sure about Feng Shui? 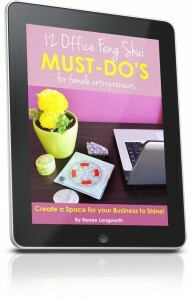 I created my eBook '12 Office Feng Shui MUST-DO'S for female entrepreneurs for just that! This eBook will take you through step-by step how to Feng Shui your office to create new abundance, confidence and focus in your business.